Lessons in humility and operator errors aside, I was pleased at the opportunity to ride another bike from Minnesota’s own Victory Motorcycles who, apparently, have been quite busy with the new-for-2010 Cross Roads and its sister bike the Cross Country. 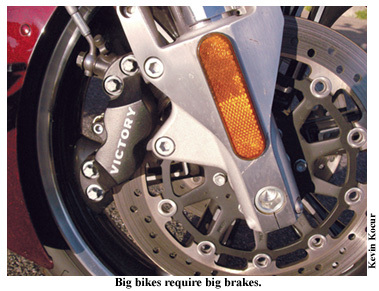 Having set the touring world on its ear with the Vision in 2008, Victory turned its attention towards the “bagger” market. Victory knew exactly the type of bike they wanted. 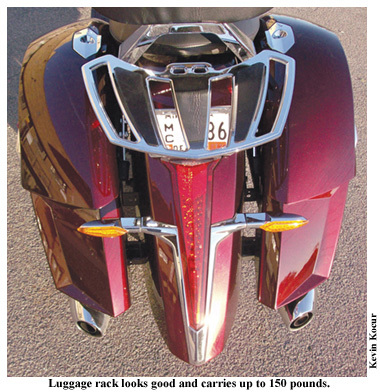 They wanted to build a better bagger: faster, able to carry more, all at a competitive price. The new bike would feature some of the same engineering as the Vision, but with the more “traditional” look of a motorcycle with a windshield and hard saddlebags. The look would be a familiar one, but this would be no cookie-cutter bike. Victory’s styling department would see to that. The engineering department would take care of the rest. They have the technology to make it lighter, stronger and faster (cue the Six Million Dollar Man theme). Featuring the same 106-inch Freedom V-twin and six-speed gearbox as the Vision, the Cross Roads’ frame is a beefy, two-piece cast aluminum affair from the Victory CORE concept bike and similar to the Vision’s. Unlike the Vision’s split aluminum tank, the Cross Roads has a more traditional steel gas tank with a 5.8-gallon capacity. 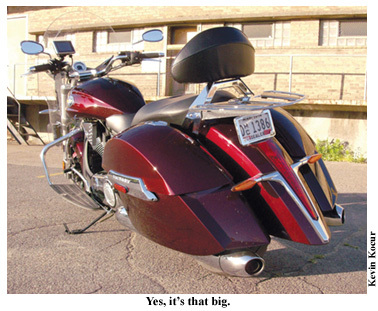 Yours truly believes that “bigger is better” when it comes to fuel tanks. I’d rather be riding, then stopping, folks. Victory claims the Cross Roads to have the most horsepower and cargo capacity of its class and they may be right. The 106-inch, fuel-injected, four-valve air/oil-cooled, 50-degree V-twin puts out 92 bhp and 109 ft-lb of torque, while the integrated saddlebags can swallow a total of 21 gallons of gear; 25 to 70% more than some of the competition. The seat is actually pretty comfortable and sits just a tad over 25 inches from the ground. I appreciated the low seat height as it allowed me to flat-foot my size 10s, which is important if you’re going to muscle around a bike that has a wet weight of 780 pounds. It’s also a good thing that the Cross Roads has a comfy seat, as the riding position locks you into one place since the shifter and rear brake are towards the front of the massive floorboards. While not my preferred riding position, the large floorboards permit you to move your feet around a bit. I was surprised that the Cross Roads doesn’t come standard with a heel/toe shifter. Once settled in, looong handlebars come back to meet you. The long-ish bars are required because you actually sit behind the engine. That would help explain the low seat height. The solo gauge is attractive and serves multiple functions. In addition to the speedometer and host of idiot lights, there’s an LCD screen with an odometer, dual trip meters, voltage meter, gas gauge, clock and tach. All of this info can be accessed by toggling a switch on the left handlebar controls. A light does come on when you have about a gallon of Hi-Test left in the tank. Our test bike also featured an optional Garmin Zumo 660 GPS mounted on the left handlebar. When starting the bike, forget about reaching up for the ignition switch on the handlebars, as the switch is on the left side of the bike. And don’t bother look for the fork lock, as there isn’t one. Turn the key, thumb the starter button and listen to the wonderful sound of that 106-inch twin. Some people love going to the orchestra, but I prefer to get my aural thrills from the road. I’m a huge fan of the 106/6 combo. The mighty V-twin sounds great and the six-speed always shifted positively, if not audibly. Belt final-drive means that you can leave the chain lube at home. I’m not going to sugar coat it, this bike is a handful at lower (i.e. less-than-parking lot) speeds but, like all good touring bikes, that mass just melts away once you get going and then she’s a delight to ride. The top-notch suspension works brilliantly and you’re able to ride at a fairly brisk pace. I did manage to scrape the floorboards while commuting to work, but a couple more pounds of air in the rear shock might have prevented that. I took off from work a little early, with a destination clearly in mind. I fired up the bike, plotted the Zumo and rolled out of the parking lot. Minutes later, we were heading up I-35 en route to Duluth—home of Aerostich, as well as the monthly Last Tuesday motorcycle gathering. I figured a nice 300+-mile round trip would help me evaluate the Cross Roads as a touring bike. When I passed the sign proclaiming the speed limit was now 70, I wicked up the throttle and shifted into sixth, which is an overdrive. The revs dropped a little and the bike settled into a nice pace. I flipped the display so the tachometer would show and played around between fifth and sixth to see the difference in rpms. Turned out to be more than I expected. There was some buffeting from the windshield that occasionally got worse but never obnoxious. In no time at all, we were past Hinckley and, before I knew it, we were approaching the exit to Cloquet. I stopped at the Frank Lloyd Wright-designed service station to top off the tank with Premium, then a visit to Gordy’s Hi Hat for some chow. Gas tank and belly now full, it was back to I-35 for the short blast to Duluth, where I stopped at Aerostich first. No matter how many times I’ve been there, I’m like a kid in a candy store. I walked out with my arms full (think Wilma Flintstone on a shopping spree) and loaded both saddlebags with my loot. Even though I had brought along a cargo net, just in case, some thoughtful placement of items allowed me to fit everything into both bags and still manage to close the lids. Well done, Victory. The temperature in Duluth was much cooler and I questioned why I hadn’t brought a sweatshirt. After looking at some neat old bikes and some tire kicking at Last Tuesday, it was time for me to leave. I picked a play list on my iPod and climbed aboard for the ride home. Southbound on I-35, I reached the top of the hill and felt the air get a little warmer and more humid. I watched the sky grow dark and it looked like we were heading into a nasty storm. By Moose Lake we hit rain and it would be on again/off again storms until I pulled into my driveway. The Cross Roads and I slogged through more than 100 miles of wet riding and dodged some pretty scary looking clouds with lots of lightning. Today, I was thankful to be on a bike with some heft and not on my Ninja 250. Despite everything that Mother Nature had thrown at us, the Victory never flinched. The windshield works very well in the rain, diverting much of the water around my helmet. I was also thankful that the stylish headlight works as well as it looks. Back home in the garage, I gave the now road grime-covered Victory a once over, especially the LED taillight, LED license plate light and backlit gauges. At least she can still shine at night. The following day it was time to wash and dry her. I really needed sun glasses once she was clean. I admired the beautiful Midnight Cherry paint and got lost in all of the styling cues. The Victory folks did a great job with this one. My week was over and it was time to return the Victory, which I had grown quite fond of. I’m not really a cruiser guy, but the Cross Roads is one that I could happily live with. Kudos to Victory for once again raising the bar and building the better bagger. I’ve never ridden a motorcycle that received such a common reaction as the Victory Cross Roads. “Wow, that thing is huge”. Pretty much everyone who saw this bike and had something to say about it started with this statement. I have to admit, it was my first reaction too. At a little over 8.5 feet long, this bike is nearly a foot longer than my Roadglide. Beyond its size, everyone loved the Midnight Cherry paint color. After the size and color, people’s opinions became very black & white. “I love it!” or “That’s the ugliest thing I’ve ever seen”. There weren’t a whole lot of people in the middle about this. Personally, I think it’s great that Victory built a bike that doesn’t look like every other cruiser on the road. It is really well engineered and has its very own distinct look. From a design standpoint it has very clean lines and “flows” really well. The bike was made available to us by the fine folks at Victory Motorcycles. I picked the bike up at Warner Victory/Polaris in Bloomington. Dean at Warner gave me a quick once-over of the bike’s attributes. Our test bike had some accessories that aren’t included on the stock version. This included seat warmers, heated handlebars, crash bar covers, lower wind deflectors, passenger backrest with luggage rack, and GPS. The first thing I notice when I climb on a motorcycle is how much of my feet are touching the ground. I’ve ridden a lot of bikes that require me to be on my tiptoes and sometimes even lean one way or the other to make good contact with the ground. Not the case with this behemoth. It’s 26.25” seat height allowed me and my 30” inseam to be flat-footed with my knees bent. Those of you who share in my vertically-challenged stature will appreciate this. I left Warner and immediately jumped on the Interstate. Ergonomically, this bike fit me pretty well. The seat is big and comfy and held me in a position that allowed my grip on the bars to be relaxed and my elbows bent. While the driver’s floorboards are quite large and allowed me to move my feet around so I could stay comfortable, they also caused me to have to move my feet to shift and brake. After finding the sweet spot on the floorboards, I got up to highway speed quickly and was able to slow to rush hour speed just as fast. Riding in rush hour is not my favorite thing to do, but this bike did it pretty well. My clutch hand didn’t cramp up and despite it’s size, the Cross Roads is an easy bike to balance at slow speed. As traffic opened up I was able to get it into sixth gear where this bike is meant to be. I was very comfortable at highway speed, no buffeting or excessive noise. Just cruising. A couple of days after picking up the bike, I took it on a little road trip. There were five other bikes with me and we headed into Wisconsin. The high temperature for the day got to a whopping 45?. As well as the temperature being fairly low, we also encountered wind, rain, sleet and snow. I ride quite a bit in cold weather and this was probably the most comfortable I’ve ever been. Granted, heated seats and bars are something I’ve never had but I would strongly consider them after this experience. The Cross Roads has a very smooth ride and Editor Pearman-type exhaust. While these pipes won’t save any lives, you get just enough of a rap when accelerating to know you’re on an American cruiser. I rode on paved roads in bad condition, paved roads in good condition, and a short stretch of gravel road, all at various speeds. For a big bike, it rides really small. The 106ci/1,731cc motor which produces 92 hp and 109 ft-lbs of torque has plenty of power to run Interstates all day long, and the low center of gravity makes running twisties fun. I dragged the floorboards on this bike no more than I would on my bike. I took one late night ride so I could check out the lights. I hit a deer once late at night so field of vision is very important to me. The Cross Roads didn’t disappoint. I rode outside the city so I wouldn’t be affected so much by ambient light and was pleased with both low and high beam settings. The change from low to high increased the depth and width without losing anything from the low beam setting. The single gauge light was almost too bright. The tail/brake light is LED and very bright as are the turn signals. My lovely bride offered to be a passenger for a quick 15-mile ride, which is about her limit for sitting behind someone, she said it was comfortable and thought the separate heated passenger seat was nice. Having her behind me did not noticeably affect the ride or handling. This bike is new for Victory in 2010. With an MSRP of $16,599 it definitely falls into the high-end cruiser category. There were two things that I thought were missing with a bike at this price point. It had no heel-toe shifter and was also without passenger floorboards. I’m certain both could be added as accessories but I expected them to be standard equipment. 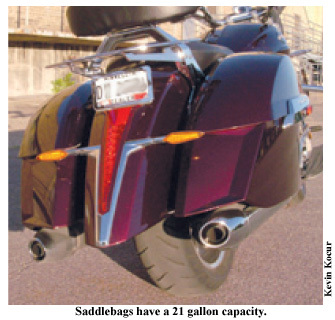 The saddlebags on the Cross Roads are ginormous. Sadly, as is the case with most cruisers, they won’t accommodate a full-face helmet. Our test bike had bag liners with handles, which worked great for transporting stuff to and from the bike. The passenger backrest and luggage rack were very nice. This luggage rack was one of the nicest I’ve seen on a cruiser. It looked really good and has a load limit of 150 lbs. When it comes to high-tech stuff on a bike, it’s lost on me. On my bike I have a compass, no GPS, I have full gauges, with needles, and the only digital readouts I get are my odometer and trip meters. I do have a stereo, which is all the distraction I can handle. I usually throw in an MP3 CD with about a hundred songs on it and I don’t need to touch it again till the next gas stop. The Cross Roads has a single gauge that displays your speed. There is a small window at the bottom of the gauge that acts as your tachometer, fuel gauge, voltage gauge, clock, odometer, two trip meters and even shows hours of operation. You toggle through this plethora of information with a little button on the backside of the left handlebar control switch. It was easy to do but I found it a little frustrating. I’m sure it was set up this way to maintain the clean, uncluttered look of the bike. Me, I’m a function before form guy. The GPS unit on our test bike had a quick release, which I quickly released and safely stashed it in one of the saddlebags. The last thing I want on a motorcycle is a color screen that tells me when to turn. I have a hard enough time paying attention. 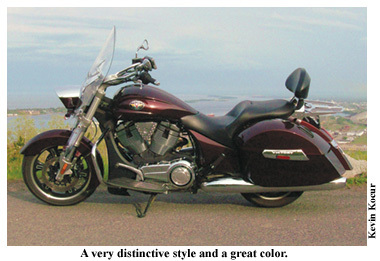 If you’re looking for a big cruiser, I would definitely recommend looking at the Victory line of motorcycles. I was really impressed with the Cross Roads overall. As soon as I sat on it I could tell a lot of time and energy was put into its development. It just felt really solid and ready to go. It had quick acceleration and great braking. I averaged between 40 and 45 mpg, which really surprised me for a bike with a 106ci motor. When I dropped off the bike at Warner, Dean asked me, “What didn’t you like about it?” Besides the lack of heel-toe shifter and passenger floorboards, all I could come up with was “the way it looks.” I was a bit embarrassed by my response. I guess my taste in motorcycles leans more toward vintage and classic looks. It would appear form matters more to me than I think because the Cross Roads functions exactly as a cruiser should. “That’s a fat guy’s bike”.